Bread. It comes in loaves, french stick, rolls, etc. American Mexican food. Beef, cheese, tortilla. Combine as you please. It has to do with form and function or purpose. How do you like your pasta? With a lot of tomato sauce or light -buttery, creamy? The tubes, shells and spirals scoop up alot of sauce while the smooth forms, spaghetti, linguinis work/taste better with creamy sauces. That doesn’t explain the 600 shapes, except to say the more choice you give people the more confused they become and loose sight of what they doing in the kitchen. The producers don’t have a problem with this, as long as the consumers buy pasta in what ever shape and form it’s made in. I second the comment on American Mexican food. Tacos and burritos are identical in filling. Probably ditto for the chalupa, too. (Incidentally, I never came across a chalupa outside of my elementary school cafeteria.) I’m sure there’s more, but I stay away from American Mexican food since I discovered it’s all the same ingredients. 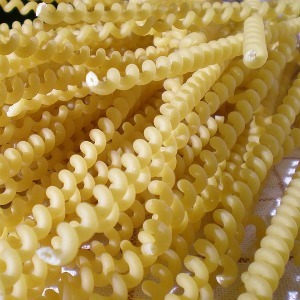 I came across this image, trying to find my favourite [ever] pasta, that is really rare to find – I bought it from an Italian pasta shoppe in Montreal back in the 90s – something similar seems to be “fusilli bucati corti” – it came double-long, and was IMO perfect (spiralled spaghetti bent at one end, to fit in regular packaging) as my favorite is spaghetti or shells / but each does change the taste (even the size of the shells), as it’s a different shape, and thus how it interacts with your mouth, tongue and the sauce distribution all affect your impression. If you don’t believe me, try eating your favorite sandwich (or layered chocolate bar) upside down – how the layers reach your pallet changes, thus the taste. I def prefer spaghetti vs angle hair, spaghettini, linguini, fettuccine, etc., no question about it, but even that [spaghetti] can be hard to get at a nice resto because it is “too basic n boring”.